This is a solid color boy's sized pretied zipper tie with a medium satin microfiber finish. The tie measures 2.25" wide and 11" long. The tie is tied already and features an adjustable sliding zipper. To open, hold the knot firmly in one hand and pull the loop open. Slip it on, and hold the tail end as you slide the knot up into place. Takes seconds to put on and makes a perfect knot every time! Well made with a soft but durable lining to give it a nice body and weight. Boy's size ties really depend on the height of the child. Generally, this tie will fit ages 2-5. For the best fit, measure from the boy's neck to the belt line. This zipper tie is 11" long. 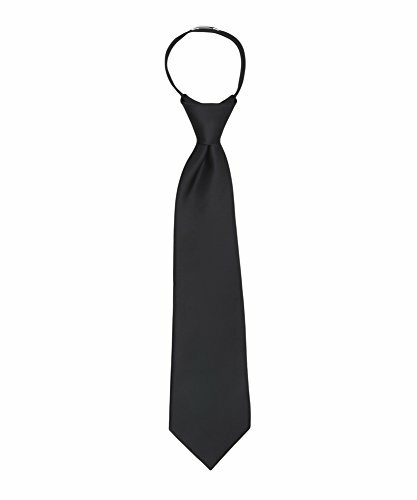 Check out our other options for boy's size ties available in a self tie or other pretied zipper sizes. This item is part of the trademarked Jacob Alexander collection of men's and boy's neckwear and accessories. Currently containing 37 colors in a great array of cuts and sizes, the collection is known for its quality and attention to detail. Color matching is done carefully so that we are able to match up all components of the collection. Our collection consists of Regular ties, XL ties, Slim ties, Skinny ties, Boys ties in regular self tie, 14" and 11" pre-tied zipper sizes. We also carry Infants hook and loop ties, Pocket squares, Self tie bowties, and Pre-tied bowties for men and boys. To top it off, we also offer matching silk knot cufflinks. In addition to all of our stock goods, we offer custom orders for any product using any of our solid color collection fabric. So if you don't see something just ask! Cummerbunds, Ascots, Vests, are all available upon demand. All of our products are backed by a 100% money back guarantee. If you are not satisfied with any one of our products for any reason at all, let us know and we will be happy to refund your purchase in full. We take pride in making our products and we want you to take pride in wearing them too! Pretied Boys Zipper tie - Ready made knot - easily zip up and down to open and close. Takes seconds to put on. Approx age 2-5. See description for detailed size info! Perfect accessory for Weddings, Parties, Church, School, business or casual wear! If you have any questions about this product by Jacob Alexander, contact us by completing and submitting the form below. If you are looking for a specif part number, please include it with your message.